Professor Jaramillo invited me to accompany him and his three doctoral students; Sandra, Heraldo and Christian out on the wetlands to collect samples for laboratory testing. I walked through the quiet streets of the slumbering city on Easter Saturday, past the beautiful swan posters in shop windows produced by the Accion por los Cisnes (Action for the Swans) and the wall emblazoned with anti-CELCO graffiti, and waited by a pontoon on the rio Calle Calle for the university boat to arrive. 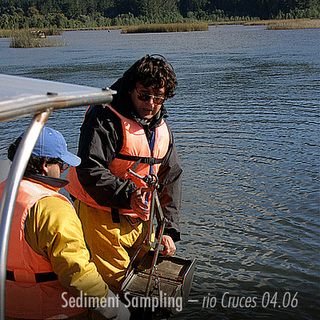 It pulled in on the appointed time, which was surprising, because Eduardo and the students had been on the wetlands before dawn collecting samples in the upper reaches of the Sanctuary. We spent the morning and into the afternoon collecting water and sediment samples as well as the roots of rushes from designated testing sites in the lower reaches of the Sanctuary, for analysis back in the laboratory, in addition to which on site instrumentation testing of the water was carried out. The following were being tested for: turbidity, temperature, salinity, density, conductivity, direction and velocity of current, TSS (Total Suspended Solids – organic matter) and DS (Dissolved Solids). No single moment of my stay in Valdivia brought home to me the reality of the ecological collapse that had occurred in the wetlands, than when, after only a few minutes on the boat, we exited the channel between the island of Teja and the mainland. The channel connects the rio Cruces with the rio Calle Calle, and while it is grandly named the rio Cau Cau, it is only about one kilometre long. At that moment, as we turned the corner into the Sanctuary, in the crystalline light of an autumn day in the southern latitudes, I saw a stately pair of black-necked swans in the far distance gliding amongst the rushes on the far shore. “In the past”, said Eduardo, “you would have seen a thousand birds here”. 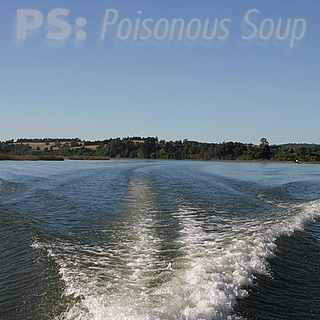 The day was beautiful, but with a beauty that would break your heart in the knowledge that the water the boat was skimming across, was, beneath its blue surface colour which was a reflection of the autumn sky, nothing but a poisonous soup. “There is a sinister symmetry to all this”, I replied. “These wetlands were created by a natural disaster in 1960 and destroyed by a man-made one 44 years later”.